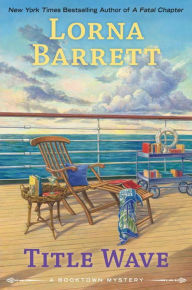 Synopsis (from bn.com): Tricia and Angelica leave Booktown behind for a pleasure cruise, but they’re going to need their life jackets because a murderer has also booked passage—in Lorna Barrett’s New York Times bestselling series. My thoughts: Tricia and her sister Angelica are back for the 10th installment of the fabulous Booktown Mystery series. I truly love this series – after all as a booklover who wouldn’t love an entire town full of nothing but bookshops one after another – I’m in love. I particularly loved this book in the series as Tricia, Angelica, and her entourage take off on a cruise as Tricia’s bookstore continues to undergo the repairs after being destroyed by fire. I really love when Cozy Mystery authors take the characters out of their normal setting for one book – it is a refreshing change. I enjoyed the new setting of this book – not bad to spend an entire book on the deck of a cruise ship, eating in the great restaurants, and of course solving a murder mystery. Now here is hoping that the next book in this series involves a grand opening of Tricia’s newly remodeled shop!! Of course looking forward to the next book!! A great, fun, book focused mystery series that every book lover would love!